Wisconsin Football Preview: Defense « Roll Out the Quevedo! The Wisconsin badger offense is as close to a sure thing as we’ll see in college football. The defense…not so much. 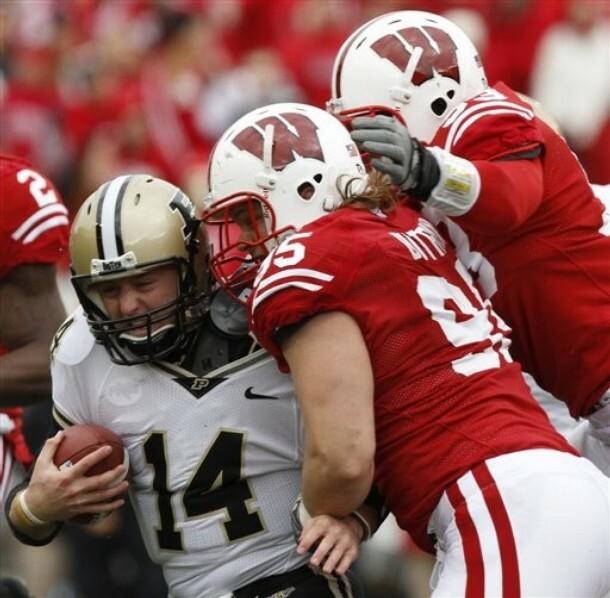 Wisconsin was predicted to finish third in the Big Ten in large part because of their defense. The UW finished #1 in the conference in scoring offense and will return nearly all of that production. The defense suprised many and finished #4 in the conference in scoring defense. They will return seven starters on defense, holes are present however. UW will have to replace both DT’s and playmaking safety Chris Maragos. Upfront: O’Brien Schofield is irreplaceable for this team. Schofield was a force in all phases of the game. He was a strong candidate for conference defensive player of the year. He rushed the passer, he played the run, and set the tone with his energy. Schofield has taken his game to the NFL and will be replaced by Louis Nzegwu. Nzegwu brings tremendous athleticism to the field, he starred in high school as a tailback, but has grown into a 6-4 250 lb. DE. His athleticism cannot be questioned, his experience can. He showed flashes last year, but his uneven spring performance led some to wonder if he might be supplanted by playmaking sophomore David Gilbert. There are no such questions on the other side. J.J Watt burst onto the scene and has caught the attention of NFL scouts. He has long arms, a high motor, and a quick burst off the ball. He figures to be the leader of this defense. The tackle rotation is the defenses uncertainty. There are some impressive young players in this roation including Jordan Kohout and Patrick Butrym who figure to start in September. These players fit the traditional mold of UW DL, they are powerful run stoppers who play with a high motor. Their biggest challenge will be their experience. UW has brought in some very promising DT’s in recent recruiting classes including Beau Allen and Anthony Mains. The Backers: No player captured more attention on the UW team last year than Chris Borland. I have to admit, he is rapidly becoming this writers favorite all time Badger. Quite simply all he does is make plays, and big ones! He started out in spot duty but was pressed into a larger role as a result of injuries. He didn’t disappoint. He proved assignment sound and impacted the game in all areas. His amazing instincts and motor would seem to have poised for stardom. Several publications have him pegged for first team all conference. He is unlikely to unseat defending defensive player of the year Greg Jones as the leagues top player, but it is likely that he will hold that title at some point. Culmer St. Jean has the confidence of the coaches and seems sure with his assignments. He seems limited athletically and doesn’t make a ton of plays. Mike Taylor returns with a clean bill of health and hopes to build on a strong season cut short by injury. Should he stay healthy, he has significant ability and can really help this group. Should he get hurt again, Blake Sorenson is the groups top backup. This is not a group blessed with great depth. All Chris Borland does is make plays. Secondary: This is an area with a lot of questions. Aaron Henry was a decorated HS player who held an offer from Fla. but has struggled with injury. He has shown flashes of being a very good player, but injuries have forced him to move to safety. Some have felt this is his best position, 2010 shall show us. Jay Valai is the groups most experienced player, he is a ferocious hitter, but he is limited in coverage. The corners surpassed expectations, but the group is hampered by a lack of depth by starters Devin Smith and Niles Brinkley. Overall: Wisconsin figures to be very good against the run. 2009 saw UW finish atop the league in rushing defense. There is little to suggest that they won’t be very good against the run in 2010. Their pass defense is however an area of concern, 2009 saw UW finish 10th in the conference in this area. Concern looms as their is little to suggest that the UW has improved measurably in this area, particularly with the loss of Schofield. Wisconsin was 4th in the league in forcing turnovers and returns some players who have shown ability in turning the ball over. Replacing Chris Maragos will be a significant issue in this regard. Whether or not UW can stop the pass is likely going to be the key to their season.